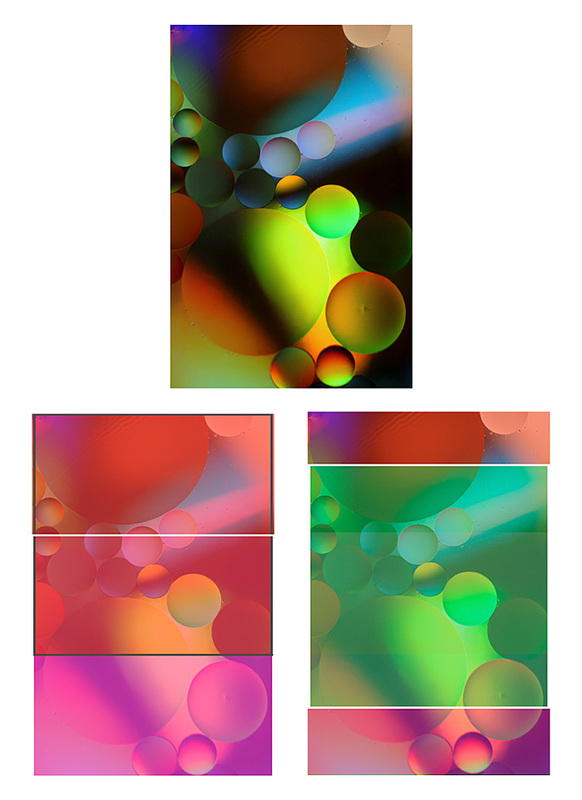 Deciding how to crop a single image to create a triptych can be challenging. Should you go for a vertical or horizontal cut, or even a ‘T’ cut to maximise the potential for your three part construction? 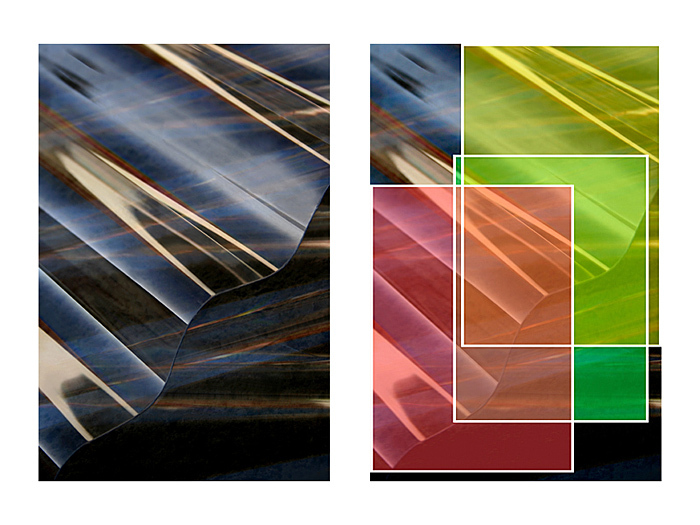 Must you have completely different material in each panel? 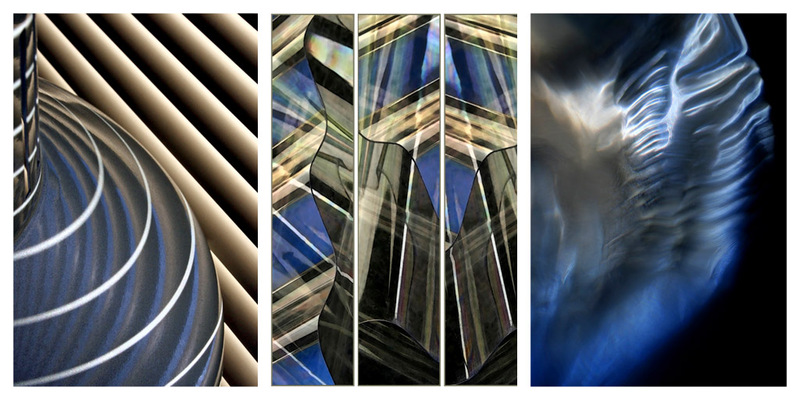 Working with abstracts has opened up many possibilities for me. 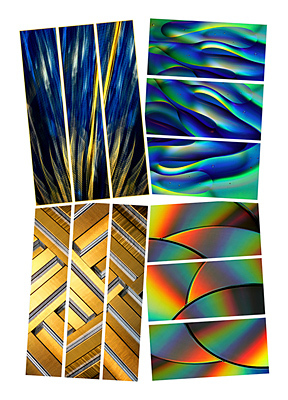 I’ve discovered that it’s perfectly OK and even desirable to have some elements of one panel overlap and appear in another, as long as your triptych is enhanced by using this technique and you’ve got a good compositional reason for doing so. 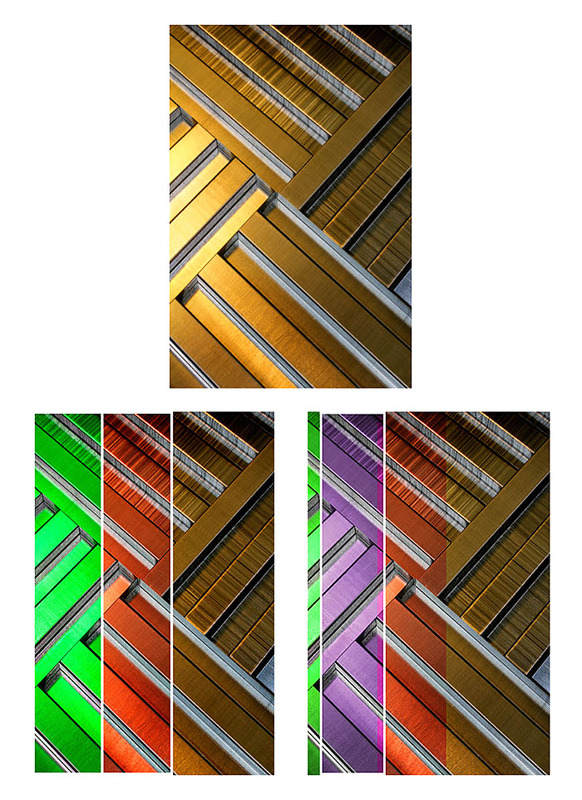 So in this series of examples, I thought I’d show you my original source image and beside it, the image again, this time overlaid with blocks of colour representing where I cropped into the picture. You’ll see that they overlap, sometimes by quite a lot. 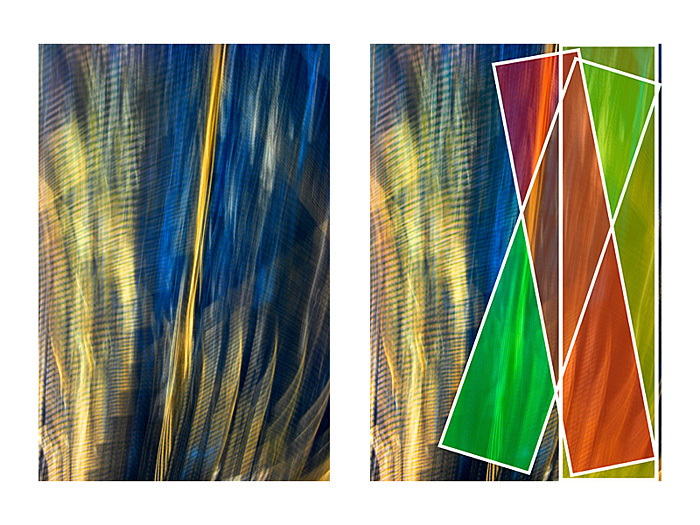 We’ll then take a look at the resulting triptych. Here’s an example of some tightly overlapped cropping, focusing on the most interesting and visually complicated part of the image. These cropped sections were then transformed into ‘Undulation’. I really enjoy the swirls and rivers of colour and shape. As you make your way down each panel, these undulating forms appear to connect and continue their surreal, sinuous dance. Notice in the triptych I have changed the orientation of the cropped sections. They’re now horizontal, whereas in the original source image, they appeared vertically. 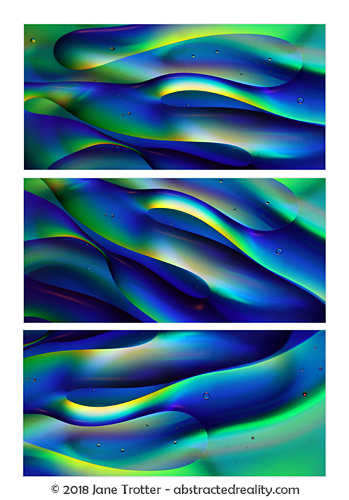 However, for this particular source image, I also wanted to experiment with making a horizontal triptych and found that rotating the vertical triptych 90 degrees to the left produced equally satisfying results. 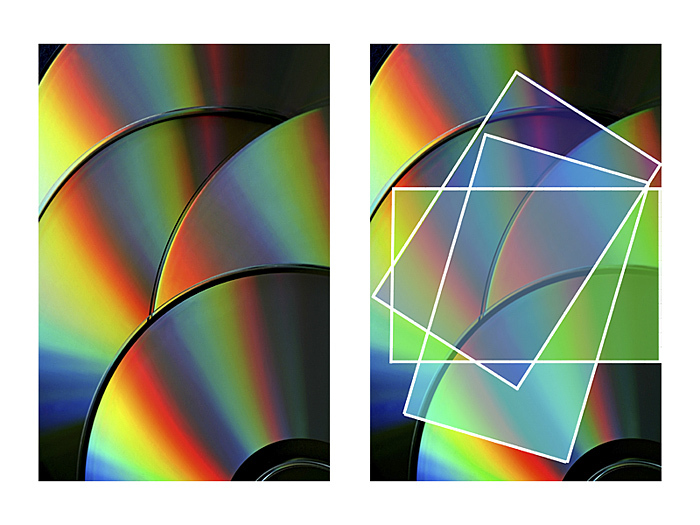 This next example is four overlapping CDs. The outer parts of the image didn’t interest me as much as the middle, with the strong intersecting point of the two CDs at the front. You’ll see here too, that I’m quite at home with cropping on an angle to get the sections I want. 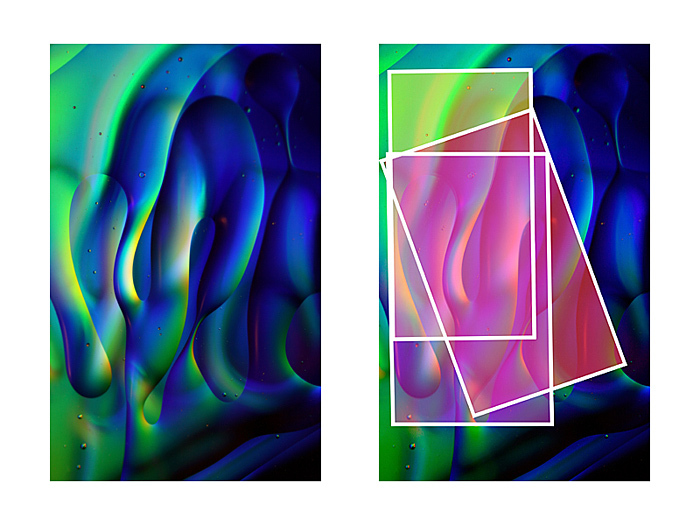 These cropped sections formed the triptych ‘Rounded Edges’. 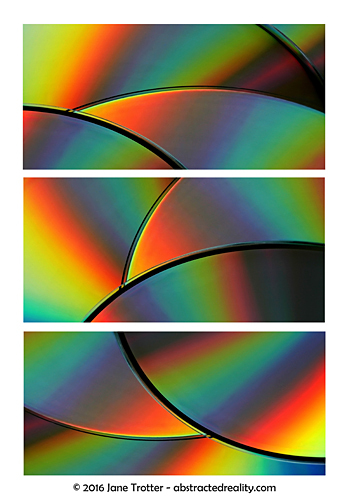 I wanted to align the curves of the CDs so that there was a natural progression down the panels – in the top two panels the edges intersect, while in the bottom two the circular connection continues behind the CD thrusting inwards from the right. Here I’ve taken a picture of corrugated plastic sheeting with some interesting reflections. Between them, the three crops cover a good portion of the entire width and height of the image. 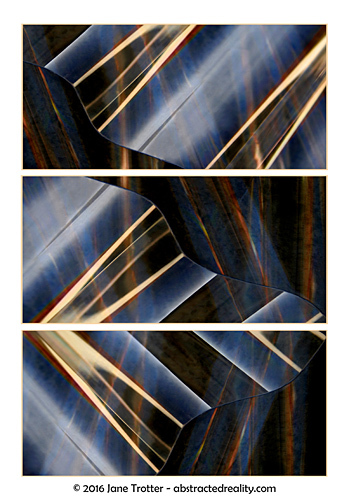 This is the resulting triptych which I call ‘Coming Together’ – for me this image has a sense of activity about it – you’re just waiting for those top two panels to come together and catch up with the bottom two which are already joined. The lines and colours on the plastic and in the background echo each other, but are not an exact repetition and result in a quirky type of symmetry. 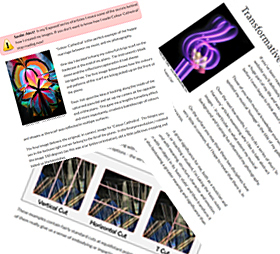 As with the earlier examples, the panels are now presented horizontally – a departure from their vertical orientation in the original image. Here’s another image where I’ve tended to concentrate on one particular area and used the diagonal cropping technique. The somewhat fractured yellow line running up the middle grabbed my attention and I wanted to see what I could create using this as the primary subject matter. 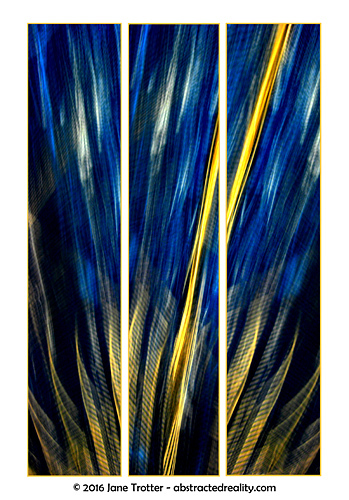 The final triptych is, in fact, called ‘Fracture’. I’ve accentuated the obvious cut and sense of disconnect in the line by breaking the continuity across the middle and right panels of the image. I’ve included two images of the cropped sections for this example so it’s easier to see where each panel begins and ends. Choosing a square format, the green panel overlaps with both the red and the pink, creating a large concentration on the material at the centre of the original picture. And here’s what it became – ‘Orbital Congestion’. The three panels are linked through the curving ‘S Bend’ of the smaller orbiting ‘moons’ which encircle the larger planetary bodies. Originally, my third (purple) panel was going to be a natural continuation along from the red section. But it started to encroach into some of the darker areas in the original shot and I just felt it didn’t quite work with the two panels I already had. So I decided to crop in again over the areas I’d already covered, and I got something I was much happier with. 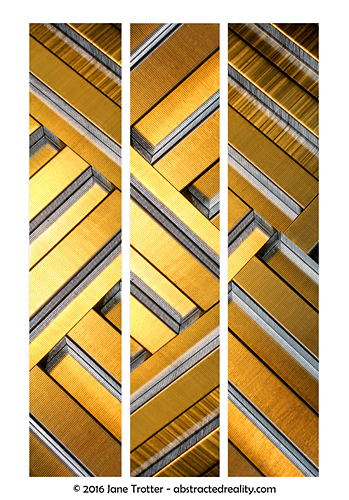 The final result is ‘Terraces of Gold’. To help you de-code this, the middle panel is the purple panel, rotated 180 degrees and flipped horizontally. My inspiration for this work was Escher’s mesmerising drawings of the never-ending stairs. New Ideas to Play With! I hope this has given you some new ideas about cropping and how you can approach making your triptychs in a slightly different way. Particularly with your abstract shots, have a go at overlapping your sections and seeing what unusual and unexpected results you can achieve. 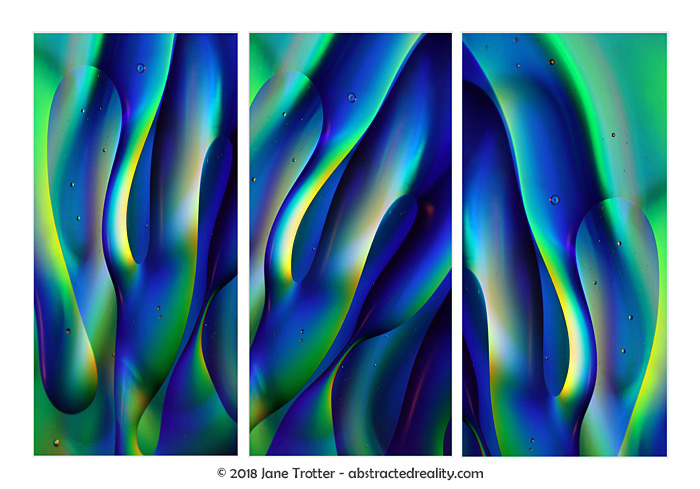 If you’d like to explore this technique a little more, my article ‘The Art of Creating a Triptych’ details the process of how I created the triptych ‘Over the Shoulder’ using similar techniques to those I’ve outlined here. If you’re still hungry for more, there are several other articles in the ‘Talking Triptychs’ series which you can sink your teeth into!